Ce document au format PDF 1.4 a été généré par , et a été envoyé sur fichier-pdf.fr le 07/01/2015 à 03:18, depuis l'adresse IP 121.99.x.x. La présente page de téléchargement du fichier a été vue 1336 fois. Taille du document: 297 Ko (66 pages). C’est l’auxiliaire du présent progressif et du prétérit progressif. are we not? aren't we? 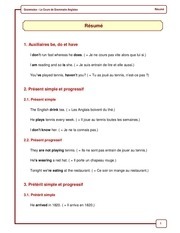 C’est l’auxiliaire du present perfect et du past perfect. has he not? hasn't he? passé employé comme adjectif c’est is. tantôt l’auxiliaire avoir, mais au present perfect en anglais c’est toujours has. l’auxiliaire du past perfect alors que would est celui du conditionnel. C’est l’auxiliaire du présent simple et du prétérit simple. does it not? doesn't it? do you not? don't you? faire et have = avoir). doesn’t be, does he be? simple et au prétérit simple. On utilise les auxiliaires pour éviter de répéter un verbe dans une même phrase. Ex : I don’t run fast whereas he does. au lieu de dire I don’t run fast whereas he runs fast. I am playing tennis and so is she. singulier (he, she, it) pour laquelle on rajoute un s au verbe. lorsqu’on rajoute le s du pluriel à un nom. Ex : I play tennis every week. She goes to the cinema twice a month. We have breakfast at 8 am. ≠ We’re having breakfast at 8 am. dire “je suis entrain de savoir”. chapeau.” on emploie quand même le présent progressif. Ex : Tonight we’re eating at the restaurant. Next month, I’m going to England. phrase et de voir si en français on utilise un présent à valeur de futur proche. Et pour les verbes irréguliers : voir la liste des verbes irréguliers. Ex : She put on her coat, took her umbrella and opened the door. mais pas “since 10 o’clock”. Ex : He lived in Paris for 10 years. Ex : He was walking in the street. Ex : (1) He was sleeping when someone knocked at the door. (2) When I arrived, they were playing tennis. (3) While he was reading, his brother came. Ex : They were playing cards while she was sleeping. Ici les deux actions sont entrain de se dérouler prétérit progressif. Though he wasn’t driving fast, he had an accident. though au lieu de when ou while. Ex : I would rather / I’d rather you didn’t go there. She would rather / she’d rather we watched another movie. Ex : I would rather / I’d rather not go there. She would rather / she’d rather watch another movie. Ici on demande s’il peut venir, peut-être qu’il pourra. Ex : I wish I had a car. prétérit (voir la liste des verbes irréguliers). Ex 1 : Look! They have bought a new car. que l’on constate qu’il y a une nouvelle voiture. Ici on emploie le prétérit simple car on insiste sur l’action, de plus l’action est datée. action : on dit où elle s’est déroulée (à Londres) prétérit simple. à faire correspondre les temps de l’anglais avec ceux du français. Ex 2 : Oh no! I’ve forgotten my wallet. – Yes, I have. ( = Oui.) sous-entendu Yes, I have seen this film. ou : – No, I have not (seen it). On n’insiste pas sur l’action, on veut seulement savoir si oui ou non il a vu le film. I haven’t had any breakfast this morning. I didn’t have any breakfast this morning. Ex 1 : a) We’ve been playing tennis since 10 am. b) We’ve been playing tennis for 40 minutes. Ex 2 : I have been looking for you for an hour. a) Since when have you been playing tennis? b) How long have you been playing tennis? forme progressive (c.a.d en -ing). I’ve liked tennis since I was a child. verbe, alors il a une forme progressive. a) Present perfect : Look! They’ve bought a new car. b) Past perfect : Yesterday, I saw that they had bought a new car. a) L’action “acheter une voiture” a été effectuée avant le moment présent. b) L’action a été effectuée avant un moment passé (le moment où “j’ai vu”). b) When I arrived last week, she had just left. a) Elle est partie avant “maintenant”. b) Elle est partie avant le moment où je suis arrivé qui est un moment du passé. Ex : Style direct : He said: “I saw her yesterday”. Style indirect : He said that he had seen her the day before. moment où il l’a dit donc antérieurement à un moment passé. Ex : He has been studying for two hours. When I saw him, he had been studying for two hours. Le futur avec will correspond au futur simple en français. He will / he’ll play tennis next week. Will they not / won’t they buy a new car in a few months? WILL peut aussi exprimer la volonté, voir le chapitre 13. Cette expression correspond au futur avec “aller” en français. Ex : (1) The train arrives at 6. (2) We have lunch at 12, take the plane at 14 and arrive at 17. Ex : I would play tennis if it didn’t rain / if I had finished my work. I would have played tennis if it hadn’t rained / if I had finished my work. She would help us if she could. 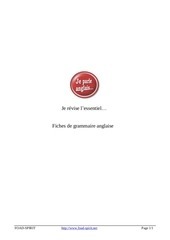 Remarque : on écrit were au lieu de was après if (if I were et pas if I was). 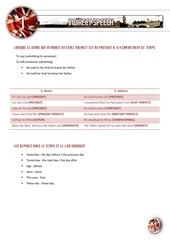 • Pour exprimer un futur dans le passé au style indirect (voir le chapitre 11). la 3ème personne du singulier de l’impératif). Ex : Let’s start now, shall we? En français on utilise plutôt l’infinitif (résumer), parfois l’impératif (résumez). Ex : (1) Actif : John has repaired the car. Passif : The car has been repaired by John. (2) Actif : They are looking for the murderer. Passif : The murderer is being looked for. ne met pas “by them” = “par eux”, il est ici sous-entendu). oublier de la rajouter après le PP à la voix passive (ex 2 : looked for). français par une phrase à la voix active avec “on” (ex 2). Autre ex : Actif : The wind broke the window. Passif : The window was broken by the wind. Il suffit de réécrire le modal et ensuite c’est pareil que précédemment. Ex : (1) Actif : The French can win the match. Passif : The match can be won by the French. (2) Actif : Someone could have killed her. Passif : She could have been killed. Autre ex : Actif : You mustn’t break the glass. Passif : The glass mustn’t be broken. 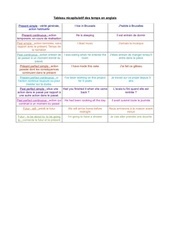 Certains verbes admettent deux compléments (ex : give, show, tell, teach, bring…). comme sujet l’un ou l’autre des deux compléments. Ex : Actif : Mark gave hera a presentb / a presentb to hera. Passif (a) : She was given a present by Mark. Passif (b) : A present was given her by Mark (rare) / to her by Mark. Actif : He’s told mea a storyb. Passif (a) : I’ve been told a story. Passif (b) : A story has been told me. La construction (a) est toujours la plus courante. La parole que l’on rapporte au style indirect garde le même temps qu’au style direct. Les repères ne changes pas non plus. Style indirect : She says (that) she’s reading. Style indirect : He has told me (that) he will go to Paris next year. Remarque : ici, la principale est respectivement “she says” et “he has told me”. Idem : les temps ne changent pas. Style indirect : She thought (that) he was playing the piano. Style indirect : He told me (that) he would play tennis twice a week. Style indirect : He cried (that) he had stolen his wallet. Style indirect : He had said (that) she had died in 1973. Style indirect : She said to him (that) she would go with him. Style indirect : He said (that) he would play tennis every day if he could. Style indirect : Last time he said (that) he had sold his car the day before. she would phone me the following Thursday''). Style indirect : She asked her if / whether she had seen him. Style indirect : He’s wondering why she says that. phrase rapportée (“where John was” et pas “where was John”). Ex : Style direct : “Shut the door”, he told her. Style indirect : He told her to shut the door. prétéritc lorsque la principale est au prétéritd. Ex : We’ll have dinner when they come. We were playing while they were sleeping. He would come as soon as he was ready. I’ll remember him as long as I live. We saw him when we arrived. Call me when you have finished. Ex : (1) The girl who is walking with her mother is my friend. (2) She has not eaten the chocolates which I’ve bought for her. pronom relatif est encadré et l’antécédent est souligné. Ex : The man who is driving a red car is my uncle. The children who lost didn’t stay long. On peut aussi mettre la préposition en fin de subordonnée, dans ce cas : WHO. Did you know the person who I talked to? The weapon which he killed her with was a rifle. 1.3. Comment savoir si le pronom relatif est sujet, COD ou COI ? sinon il est complément d’objet (CO) (1.b. whom you, whom I, 2.b. which I, which he). sinon il est complément d’objet direct (COD). Dans le cas (b) on peut dire WHO au lieu de WHOM pour un COD. d’une préposition (cas du COI lorsqu’on ne met pas la préposition à la fin). Ex : 1.1.b. The girl that you saw yesterday is my sister. 1.2.a. The book that is on the table is mine. Ex : 1.1.b. The girl you saw yesterday is my sister. 1.2.b. The weapon he killed her with was a rifle. mais : 1.1.a. The children that lost didn’t stay long. Ex : John, who was wearing a hat, was listening to his mother. This book, which he wrote last year, deals with world war II. pronom (WHO, WHICH) par THAT ni par Ø. On traduit en général ce pronom relatif par “dont” en français. Ex : The man whose car is grey is my father. The house whose windows you cleaned is my house. My sister, whose bag is black, is going to school. par “ce que” (COD) ou “ce qui” (sujet de la subordonnée). Il ne faut pas confondre les pronoms relatifs avec les interrogatifs. mais : He asked me who was driving. (interrogative au style indirect). le plus souvent deux phrases indépendantes. Ex : The girl who is walking with her mother is my friend. = A girl is walking with her mother. She is my friend. She has not eaten the chocolates I have bought for her. = I have bought chocolates for her. She has not eaten them. Did you know the person I talked to? = I talked to a person. Did you know this person? = He wrote this book last year. It deals with world war II. The house whose windows are broken is my house. = The windows of this house are broken. It’s my house. = My sister’s bag is black. She is going to school. ou : My sister is going to school. Her bag is black. WHOSE avec un antécédent humain désigne la possession (voir chap 16). What he told me was wrong. = He told me something. It was wrong. (2) I must stay in bed if I want to recover. (3) I have to stay in bed because the doctor ordered me to. Ex : Last year, I had to take the bus every day. Next year, I will have to take the bus every day. Ex : The doctor said that you must stay in bed. You don’t have to bring your dictionary, I’ll lend you mine. Ex : I had better / I’d better go on holiday, I’m tired. ( = He had to leave). Ex : He is bound to win the race / he will certainly win the race. n’utilise pas forcément le futur. langue moins soignée, on pourra utiliser l’équivalent it’s possible that. On pourra utiliser également it’s impossible that. Ex : It’s impossible that he has won. Ex : Can you listen to music and read at the same time ? Ce fichier a été mis en ligne par un utilisateur du site. Identifiant unique du document: 00291790.